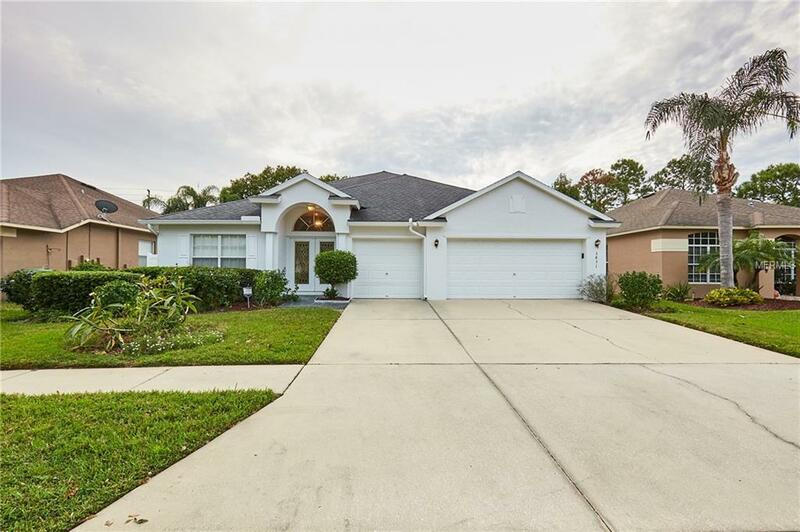 Welcome home to this highly desired Heron Point subdivision in Land o Lakes. Casual entertaining is a breeze with this homes open floor plan. The kitchen overlooks the family room, breakfast nook, and covered lanai. Host dinners in the formal dining area located off the front entry. A Den/Office is in the front of the home and could be used as a 5th bedroom as well. A second Master suite could easily be a In-Law quarters or teens room if desired. A huge "eat in kitchen with loads of cabinet and pantry has a inviting breakfast bar with views out back to the screened Lanai. Perfect for familys to spread out or to entertain guests. Sliders from the family room lead out to the covered and screened lanai. Lovely back yard for playing or pets. Desirable Three way split floor plan allows for greater privacy and the two Master suits are each on their own. The first large Master Suite has a walk in closet and a view out back. The huge master bathroom has his and her vanities, garden tub and glassed in shower. The office/ Den has double glass French doors and a lovely view of the front yard. The second Master suite has a private entrance to the bathroom and view to the side yard. The third and fourth bedrooms are on the other side of the house. With a formal living room and dining room there is plenty of space to spread out. Gleaming wood floors cover most the homes living space. This Light and bright open floor plan makes this home feel awesome! Heron Point has no CDD fee and a low $450 per year HOA fee.